After a trio of deadly explosions rocked Brussels on Tuesday, killing at least 31 people and injuring more than 200 others, artists took to social media and the streets of Belgium to show their support through sketches and cartoons. The sketches ranged from poignant to defiant, and many were produced by French artists in solidarity with the people of Belgium. France endured two terror attacks last year: one in January on satirical magazine Charlie Hebdo and another on Paris in November. A number of sketches portrayed beloved cartoon adventurer Tintin, the creation of Belgian cartoonist Herge. On Twitter, Instagram and elsewhere around the Internet, the red-haired reporter is shown in his signature trench coat, with his white dog Snowy — shocked and saddened versions of their usually indomitable and irrepressible selves. Some cartoonists drew "too soon" criticism in response to depictions of Tintin and Snowy as bloodied and battered. The comic series "The Adventures of Tintin" was made into a movie in 2011 by Steven Spielberg. The Tintin cartoon books have sold in the tens of millions of copies, but only in Belgium has the fearless reporter and his dog been ingrained in the DNA of most youngsters since the 1950s. Herge died in 1983 and is considered a national treasure in his native Belgium. Others on social media borrowed from the Charlie Hebdo tragedy, using the hashtag "JeSuisBruxelles," or "I am Brussels," just as those after the Paris attacks did when spreading the sentiment "JeSuisCharlie." #Brussels and #PrayforBelgium also started trending worldwide Tuesday on Twitter. Shortly after the attacks, chalk drawings emerged on the streets near Bourse Square, home of Belgium’s stock exchange. One drawing turned into hundreds, some with inspirational messages, while others tended to fight prejudices. Emergency responders in Belgium have said 212 people were hurt, 30 of them critically and 96 seriously. Eight Americans are among the wounded. Belgian authorities have released photos of three men identified as suspects in the explosion at Brussels Airport, NBC News has confirmed. 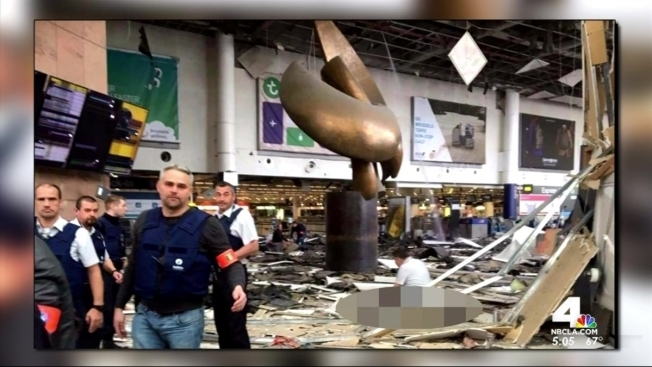 2 More Americans Confirmed Dead in Brussels: State Dept. The Associated Press and NBC News contributed to this report.